Dr Ramesh Sabhlok obtained his BDS(Honors) and MDS in Orthodontics from the Faculty of Dental Sciences, King George’s Medical College, University of Lucknow, India and Certificate in Orthodontics from School of Dentistry, University of Louisiana, New Orleans, USA. He is a Fellow of the Royal College of Surgeons, Edinburgh (FDS RCS Ed),Fellow of the Royal College of Physicians& Surgeons, Glasgow (FDS RCPS),Diplomate of the Royal College of Surgeons; Edinburgh (M.ORTH RCS Ed), and also a Diplomate of the Indian Board of Orthodontics. He was awarded WHO fellowship to USA for Advanced Training in Orthodontics at the School of Dentistry, University of Louisiana, New Orleans, School of Dentistry University of Michigan, Ann Arbor and College of Dentistry, University of Illinois, Chicago. He held senior teaching and clinical positions in India, Libya and United Arab Emirates for last three decades. Dr. Sabhlok worked as Consultant Orthodontist with the Dental Center, Dubai Health Authority, Government of Dubai, United Arab Emirates for last two decades. Presently, he is in exclusive Orthodontic practice in Dubai since October 2010. Dr. Sabhlok has presented several seminars and Symposiums as Keynote speaker in various International, National Orthodontic and Dental conferences and has many publications to his credit. He is an active member of many International Orthodontic and Dental Organizations, including the American Association of Orthodontists, Fellow of the American College of Dentists, Fellow of the International College of Dentists and Fellow of the Academy of Dentistry International. 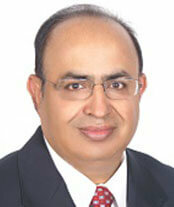 He is the recipient of several awards and honors from several Orthodontic Societies worldwide. Lingual Orthodontics-using Lingual braces from inside the teeth-Incognito Certified. Growth Modification with Functional appliances- Children with mal-aligned jaws- Ideal to use during active growth period to accelerate the growth of jaws and improve the profile and breathing. Micro-implant Anchorage – Micro-implants are tiny screws made of titanium alloy are fixed in bone to move teeth during orthodontic treatment shortening the treatment time- Dentos Certified. Surgical Orthodontics- Patients who may benefit from jaw surgery include those with an improper bite resulting from misaligned teeth and/or jaws which can improve patient’s appearance, chewing, speaking and breathing. Temporomandibular Joint Disorders Patients feeling pain, headache and clicking due to irregularities in occlusion. Cleft Lip and palate Orthodontics- Children born with cleft in the lips and the jaws. Special appliances to assist in feeding and speaking. The hospital notifies the public it serves about how to contact its hospital management and JCI to report concerns about patient safety and quality of care. The following link is provided to report a patient safety or quality of care concern to Joint Commission International (JCI).